The National Institute on Minority Health and Health Disparities (NIMHD) will host the Health Disparities Research Institute (HDRI) from August 12-16, 2019, in Bethesda, MD. The HDRI aims to support the research career development of promising minority health/health disparities research scientists early in their careers and stimulate research in the disciplines supported by health disparities science. Institute participants will also have the opportunity to meet with NIH scientific staff engaged in related health disparities research across the various NIH Institutes and Centers. This program is intended for early-stage research investigators. Applicants must have a Ph.D., M.D./D.O., Sc.D., Dr.P.H., Pharm.D., Psy. D., DDS/DMD or equivalent doctoral degree from an accredited domestic or foreign institution. Applications will only be accepted from post-doctoral fellows, assistant professors, or early-stage investigators research positions who are actively engaged in minority health and health disparities research and who plan to submit a K or R grant to NIH within the next 12 months. Individuals from diverse backgrounds are encouraged to apply. 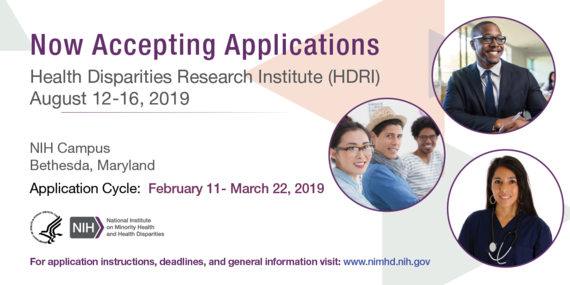 Previous participants of the HDRI or the Translational Health Disparities Course are not eligible to apply. The online application is now open. Applications must submitted by March 22nd, 2019, 5:00 p.m. EDT.